This is one of the most important and best told movies ever made and I do not say that lightly. Every scene is memorable and presented in such a sensitive way, but it’s never judgmental because it lets the images speak for themselves. There’s a scene in this film involving Ralph Fiennes’ character (Amon Goeth) about removing or changing a certain part of history; this movie is a perfect example why that character cannot be any more wrong. Liam Neeson is tremendous as Oskar Schindler because he is able to effectively show Schindler’s evolution as a businessman-turned-humanitarian. Fiennes is also amazing in this even though his character is a monster. Both actors share a certain complexity that is extremely difficult to come by nowadays. As for Ben Kingsley, at first I didn’t recognize him but after trying to figure out what his character was all about, I realized that he really looked familiar and recognized him after about five minutes of contemplation. If that isn’t a mark of a great actor, I don’t know what is. Many consider that this as Steven Spielberg’s masterpiece (among many) and I cannot agree more. Even though it spans for about three hours and fifteen minutes, I didn’t feel like I was watching it for that long. In fact, I felt like I was watching a documentary because of how real everything looked and felt; I felt like was really there. Spielberg’s decision to show this movie in black and white is nothing short of perfection. It allowed me to notice Spielberg’s techniques, such as presenting two completely different factors when something is apart but when those two are put together, they seem to complement or go with each other. Aside from the use of black and white, other examples include Schindler and Geoth’s personalities and ideals; one train heading toward a safe haven while the other heads toward hell; fusion of two, or sometimes even three, different scenes–one showing pain and misery while the other one showing happiness and celebration. The craft alone is enough for me to give this film a four-star review, but it managed to go beyond that. The one scene that really made me want to cry was near the end when Schindler regretted not selling his car or his valuable pin in order to save more lives in front of more than a thousand Jewish people he saved. It really got to me because he lost everything he had yet he was still sorry he couldn’t have done more. I remember watching this film back in high school but I didn’t understand and did not appreciate it as much. In my opinion, this is the kind of movie that should be required to show in schools when the students are learning about World War II. Spielberg has given the world a gift–a reminder of one of the darkest times in history and why we should prevent it from happening again. 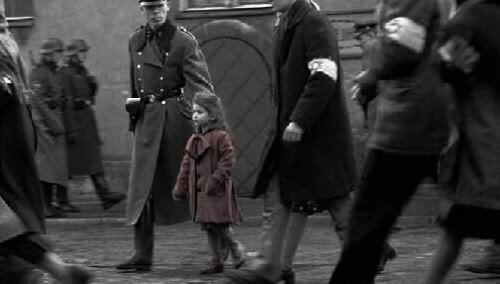 “Schindler’s List” is one of the reasons why movies are made.